62 So before Dong Yun had reached Nanzheng, Wei Yan was dead. Ma Dai joined his army to Jiang Wei's, and Yang Yi wrote another memorial, which he sent to the Latter Ruler. 63 "Wei Yan had paid the penalty of his crime. He should be honorably buried in consideration of his former services." 63 Then Yang Yi continued his journey and in due time arrived at Chengdu with the coffin of the late Prime Minister. The Latter Ruler led out a large cavalcade of officers to meet the body at a point seven miles from the walls, and he lifted up his voice and wailed for the dead, and with him wailed all the officers and the common people, so that the sound of mourning filled the whole earth. 64 By royal command the body was borne into the city to the palace of the Prime Minister, and his son Zhuge Zhan was chief mourner. 65 When next the Latter Ruler held a court, Yang Yi bound himself, and confessed he had been in fault. 66 The Latter Ruler bade them loose his bonds and said, "Noble Sir, the coffin would never have reached home but for you. You carried out the orders of the late Prime Minister, whereby Wei Yan was destroyed and all was made secure. This was all your doing." 67 Yang Yi was promoted to be the Instructor of the Center Army, and Ma Dai was rewarded with the rank that Wei Yan had forfeited. 68 Yang Yi presented Zhuge Liang's testament, which the Latter Ruler read, weeping. By a special edict it was commanded that soothsayers should cast lots and select the site for the tomb of the great servant of the state. 69 Then Fei Yi said to the Latter Ruler, "When nearing his end, the Prime Minister commanded that he should be buried on Dingjun Mountain, in open ground, without sacrifice or monument." 70 This wish was respected, and they chose a propitious day in the tenth month for the interment, and the Latter Ruler followed in the funeral procession to the grave on the Dingjun Mountain. The posthumous title conferred upon the late Prime Minister was Zhuge Liang the Loyally Martial, and a temple was built in Mianyang wherein were offered sacrifices at the four seasons. Hiding among the branches orioles are singing. Upon the throne, built for the father, sat the son. He died; and heroes since for him have ever grieved. A shining figure, clear against the sky. War-worn and weary, yet he steadfast stood. 75 Evil tidings came to the Latter Ruler on his return to his capital. He heard that Quan Zong had marched out with a large army from Wu and camped at the entrance to Baqiu. No one knew the object of this expedition. 76 "Here is Wu breaking their oath just as the Prime Minister has died," cried the Latter Ruler. "What can we do?" 77 Then said Jiang Wan, "My advice is to send Wang Ping and Zhang Ni to camp at Baidicheng as a measure of precaution, while you send an envoy to Wu to announce the death and period of mourning. He can there observe the signs of the times." 78 "The envoy must have a ready tongue," said the Latter Ruler. 79 One stepped from the ranks of courtiers and offered himself. He was Zong Yu, a man of Nanyang, a Military Adviser. So he was appointed as envoy with the commissions of announcing the death of the Prime Minister and observing the conditions. 80 Zong Yu set out for Capital Jianye, arrived and was taken in to the Emperor's presence. When the ceremony of introduction was over and the envoy looked about him, he saw that all were dressed in mourning. 81 But Sun Quan's countenance wore a look of anger, and he said, "Wu and Shu are one house. Why has your master increased the guard at Baidicheng?" 82 Zong Yu replied, "It seemed as necessary for the west to increase the garrison there as for the east to have a force at Baqiu. Neither is worth asking about." 83 "As an envoy you seem no way inferior to Deng Zhi," said Sun Quan, smiling. 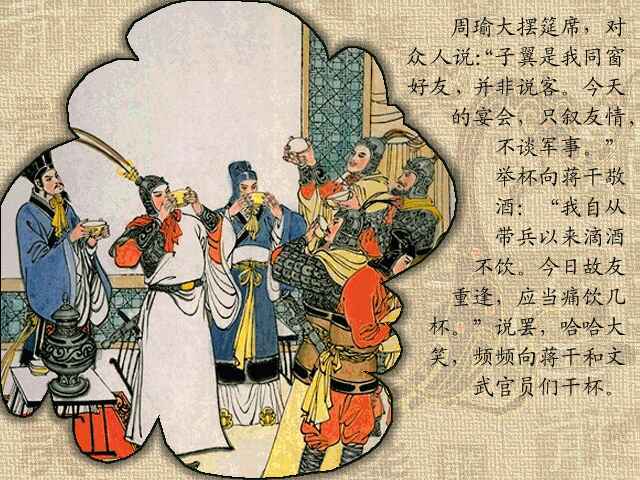 84 Sun Quan continued, "When I heard that your Prime Minister Zhuge Liang had gone to heaven, I wept daily and ordered my officers to wear mourning. I feared that Wei might take the occasion to attack Shu, and so I increased the garrison at Baqiu by ten thousand troops that I might be able to help you in case of need. That was my sole reason." 85 Zong Yu bowed and thanked the Ruler of Wu. 86 "I would not go back upon the pledge between us," said Sun Quan. 87 Zong Yu said, "I have been sent to inform you of the mourning for the late Prime Minister." 90 Sun Quan took up a gold-tipped arrow and snapped it in twain, saying, "If I betray my oath, may my posterity be cut off!" 89 Then the Ruler of Wu dispatched an envoy with incense and silk and other gifts to be offered in sacrifice to the dead in the land of Shu.